Every year, plant breeders and seed companies release hundreds of new ornamental plants, many with improved disease resistance, in a wide variety of colors. However, not every newly-released plant is tough enough to handle the high heat and humidity of Mississippi. With so many new choices it can become difficult for growers to select the right plants to meet consumer demand. One just needs to go to a garden center in spring to realize there are plenty of options for home gardeners. To take the guesswork out of determining which plants work best in different parts of Mississippi, the Mississippi Agricultural and Forestry Experiment Station conducts ornamental horticulture variety trials. Information from the trials is used to confer honors such as All-America Selection status or Mississippi Medallion winners. Trials also are used by companies to determine if the plant merits release. At the MAFES South Mississippi Branch Experiment Station, annuals and perennials of new and recent varieties are evaluated for commercial breeding companies, plant introduction companies, and nurseries. 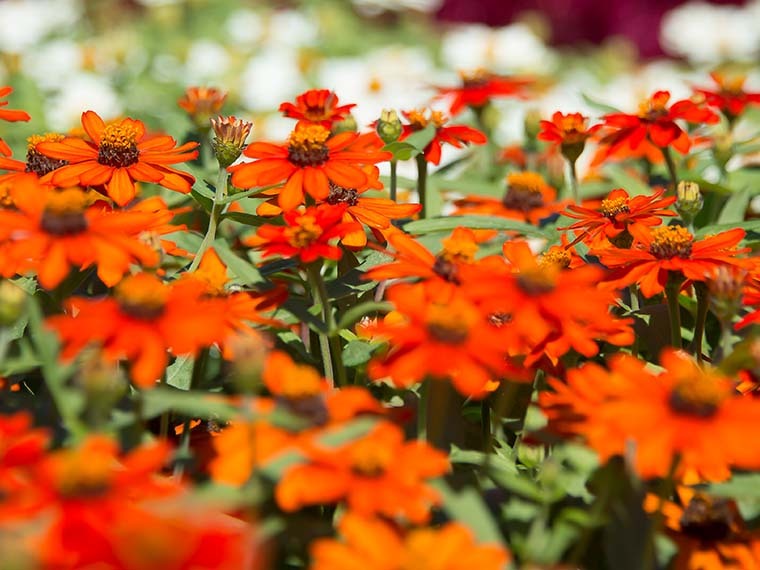 Additionally, the All-America Selection variety trials are grown from annual seeds, annual container plants, and perennials. The All-America Selection Variety Trials evaluate varieties that have not been introduced on the market. Some 200 plants are evaluated at the station annually. MAFES scientist Dr. Gene Blythe is responsible for the Ornamental Variety Trials in Poplarville. Blythe works alongside another MAFES scientist, Dr. Patricia Knight. Both scientists also evaluate woody and perennial plants as part of a multi-state research project with other Southeastern U.S. universities and the U.S. National Arboretum. Blythe spotlights many of the varieties tested in Highlights newsletter, available on-line at http://mafes.msstate.edu/publications/highlights.asp. At the MAFES Truck Crops Branch Experiment Station, ornamental trial gardens began in 2001. The station, located in Crystal Springs, dedicates two acres to variety trials and includes annuals, perennials, shrubs, and trees. Some 150 annual plants, 30 perennials, 30 shrubs, and several small trees are evaluated in the Ornamental Horticulture Variety Trials. Scientists limit inputs such as insecticide, fungicide, and fertilizer to replicate how the plant will perform in a homeowner’s landscape. Plants are evaluated on four criteria: uniformity of growth, leaf health, flowering, and landscape impact or how it stands out in the landscape. Dr. Shaun Broderick, assistant research and extension professor, manages the trials and post the annual winners on the Truck Crops Trial Gardens blog at http://blogs.msucares.com/ornamentals/. The Mississippi State Trial Gardens identifies, evaluates, and promotes plants that excel in Mississippi landscapes and appeal to southern gardeners. Located at the MAFES R.R. Foil Plant Science Research Center in Starkville, the Mississippi State Trial Gardens grow everything from bedding plants and container vegetables to perennials, shrubs, and trees. The gardens feature a growing magnolia collection, the official state tree, plus a repository from the Eudora Welty Camellia Collection, which consists of clones of each of the camellias growing in the garden of Welty’s estate in Jackson. Dr. Geoff Denny, assistant extension professor, maintains the Mississippi State Trial Gardens. In North Mississippi, ornamental variety trials are conducted in the Magnolia Botanical Garden, located at the Northeast Mississippi Branch Experiment Station in Verona. Some 20 trials of annual plants have been conducted in the garden for about 19 years. Dr. Jeff Wilson, regional extension specialist, directs the variety trials and garden. Check out a garden in your area, before making your way to the garden center. All gardens are free and open to the public.